Balance training involves exercises that prevent falling. An effective fall prevention program teaches the body how to respond to situations that find the body out of a neutral, stable position. The body is in a neutral, stable position when still, with the shoulders over the hips and the hips over the feet. Anytime this fixed position is disrupted, the body is essentially “falling,” and must compensate and adjust to maintain balance. You may even consider walking a series of mini falls as the body has to sense and control every step, always searching and grabbing hold of a stable position. To prevent falls when walking or with any other activity, the body needs to practice falling out of a position of safety and regaining stability. What better place to train for balance than in the pool? Water supports every movement and allows you to practice balance exercises with a sense of security. Last month, we discussed the process of improving balance by stimulating the body’s sensory system in natural ways. I told you how to crush your fear of falling using a 6-directional reaching exercise with the support of water’s buoyancy. Balance training requires both mental confidence and the physical readiness of the joints and muscles. It’s hard work, but I know you can do it! Once you have improved mobility, it’s time to strengthen our muscles and improve endurance. Having the ability to control the motion is what allows us to find and keep our balance. And we can’t control the motion unless our core and leg muscles are strong. To strengthen both our core and our legs, we’re going to add speed in all 6 natural directions. Better balance begins by stimulating the body’s sensory system in natural ways. Standing on one leg and holding still will help improve muscular endurance, but it does not effectively improve balance. Balance is our body’s ability to remain upright and steady. It does this by constantly feeling for the changes in body position and responds by engaging the muscles. Try it for yourself. Stand on one leg. Notice a constant wiggle of the foot, ankle, hip and probably a little wave of the hands to help steady the body. Remember, each joint in the body has multi-dimensional capabilities, which is why my training uses a unique, 6-directional movement formula. This gives the body comfortable, pain-free movement in all natural directions — forward, backward, right, left, turn right and turn left. I like to think of it as: front to back, right to left and right and left rotation. This exercise is the same movement pattern as last week, but faster. Adding this quick tempo means the range will be far less. Try it on land or in the pool: 6-directional single leg balance reach with speed. Next, reach right and left. Keep the knee on the standing leg slightly bent and move in a range that is comfortable. The range will always be small. As you progress try to increase speed. Repeat 3 to 5 times on both sides of the body. Next, reach right and left. Allow the body to tip to the side and then return to start position, shoulders over hips. You might find a small range feels best at first. As you practice this side to side reaching it will feel more natural and allow for deeper stretching. Repeat 3 to 5 times on both sides of the body. Finally, right and left rotation. Hands just below the surface moving opposite the leg. Reach the suspended foot clockwise and counterclockwise. If a straight leg is too difficult, bend the moving leg, making a knee swing. Repeat 3 to 5 times on both sides of the body. As you do the single leg balance reach, keep the standing knee soft and feel the movement at the hip and ankles. If you notice any pain or discomfort at the knee, make the move smaller and gradually increase the range. Always seek to find the range that feels best. The body will thrive in an environment where it feels safe and successful. 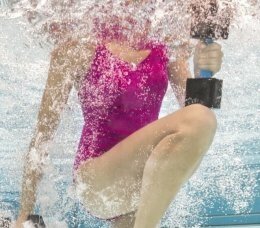 In the pool, try the Single Leg Balance exercise for both mobility and stability. Remember to do the movement slow and steady, full range, in 6 directions: front to back, right to left, and right and left rotation. That’s for mobility. Then repeat the 6-directional reach at a quick pace. The range of movement will be much less. Once you have done the exercise on both sides of the body, step out of the pool and retest your balance. How long can you stand on one leg? Did it improve on both the right and left leg? Repeat this exercise for 8 weeks. Keep track of your results and let me know how you do!